Something amazing happened. I was nominated for the Versatile Award by the awesome and lovely Caitlin. 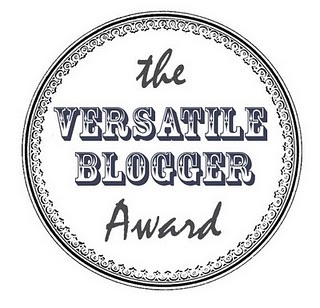 Thank you so much for nominating for the Versatile Bloggers award. I am very humbled you nominated me! And I hope you will like my 7 random fact about me. The Rules – Thank the person who gave you this award – Include a link to their blog – Next, select 15 blogs/bloggers that you’ve recently discovered or follow regularly – Nominate those 15 bloggers for the Versatile Blogger award – you might include a link back to the post on your site announcing their nomination – And of course, tell the person who nominated you 7 things about yourself. 1 I live in a cozy studio, which I call my Hobbit Hole because it has really low ceilings, I manage fine with my 151 cm frame, but my boyfriend can’t walk properly on my top floor. So he often curses about that one. In a good manner of course! 2 That I really got into make-up just about 4 years ago. 3 Buffy the Vampire the Slayer used to be my heroin during high school. I really thought Sarah Michelle Gellar rocked in that show and I just loved her fashion style. 4 I am a huge cat lover and somehow I manage to give all the cats we owned multiple names (poor cats). 5 My favorite band is Bon Jovi, and it all started with It’s my life! 6 I am really a lazy person when I am off from work ( gegge) I love lounging on my couch and get cozy with a blanky and watch TV/ Netflix/ Read. 7 I loveeeeeeee sunshine and I really dislike rain and cold. And yesss this week forecast for weather is really sunny. I hope you all liked getting to me know me a little better, and please check out my list with bloggers whom I nominated. Until the next post my readers. Thanks a lot ☺! Glad you enjoyed my post.